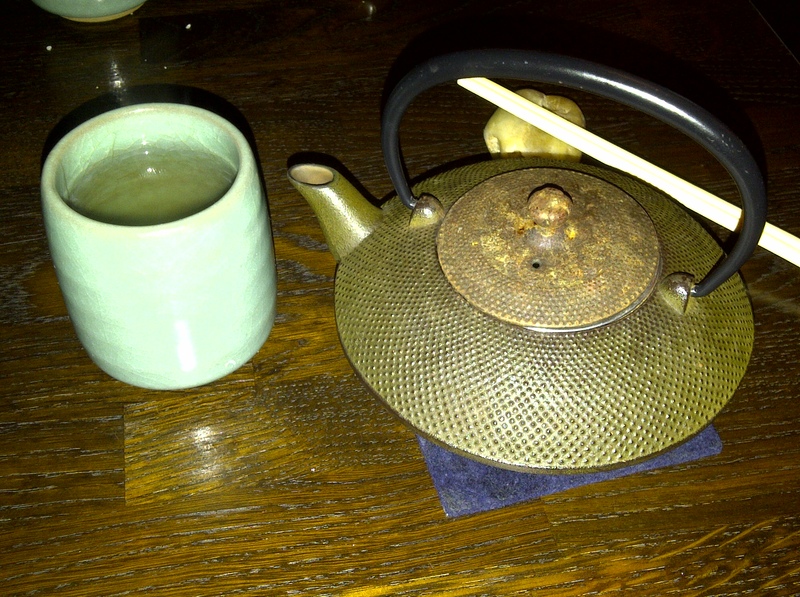 Japanese again – this time at Ginger in Zurich, where they have such an amazing ginger tea, that makes wonders with a seaweed salad or a new style sashimi. Warming effect of ginger works well with acidic and savoury sauces. Later we went to the bar at Dolder Grand. 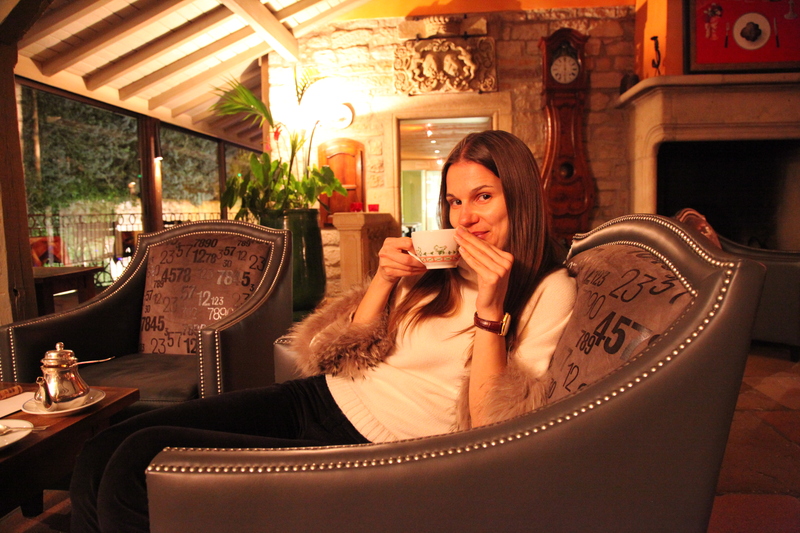 It is a chic place in the hotel on the top of the hill offering a wide selection of cognac and cigars. Though I was savouring their crunchy cashew nuts with a chamomile tea – an interesting tea and snack pairing. I made it!!! Let’s celebrate. The parent in my head rings though – ok, have fun, but be careful, you cannot go from zero to normal! It is like starting to exercise after an injury. Step by step. That is why I have decided to have a glass or two (instead two or three) during the whole night. Going to a Spanish tapas place is ideal for it. 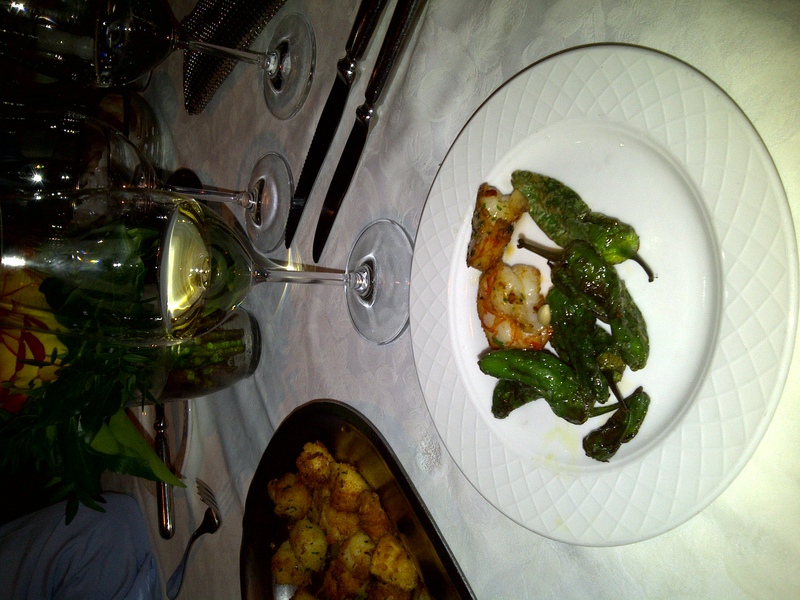 You do not think much about getting a bottle when the small and varied dishes pair well with different wines. So I usually order a wine by the glass. What I learned during the one week of the wine detox? During the whole week I missed some adventure in my life. Even though I was travelling, which is adventurous in itself, I felt that something just does not fit. I have realised that wine adds a lot of spice into my life. It sparks up my curiosity, eagerness to learn and makes conversations overall more relaxed and in-depth. Yes, being with wine or as I call it winebeing makes my life a la dolce vita. Open or not to open? My partner shouts at me: ‘Is there something better about this Tokay than are the others?’ Lifting the golden-lush bottle of a deliciously sweet Hungarian wine we got as a gift from the hotel in front of my eyes. I replied nervously: ‘Yes, there probably is since it is from a producer I have never tried before!’ I waited if he suggests to open it and try it. To my relief, he decided to be supportive and without saying anything put it back into the chilling bucket. 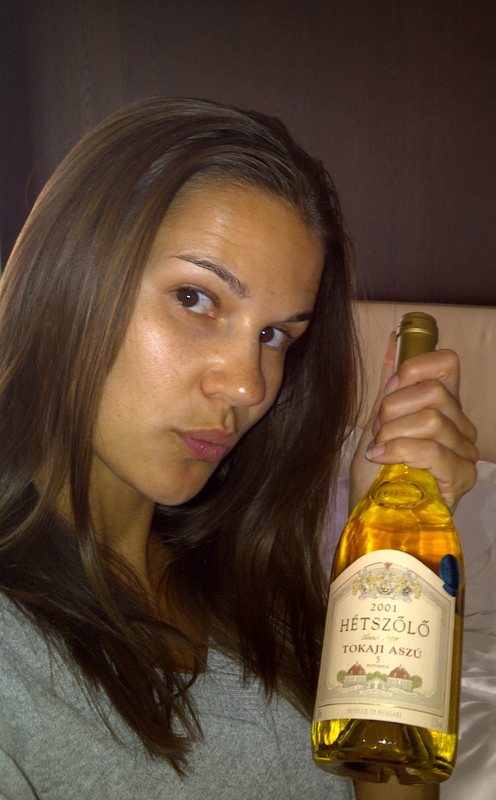 We got this bottle Hetszolo Tokaji Aszu from the hotel La Rèserve owned by Michel Reybier who bought Hetszolo in 2009 and added it to his Bordeaux winery collection. Mr. Reybier also owns the famous Château Cos d’Estournel producing a Saint-Estèphe Grand Cru Classé and the Médoc AOC Château Marbuzet and Goulée vineyards. All the hotel’s restaurants have an impressive selection of various vintages from the Château Cos d’Estournel making it surely a highlight of the wine list. We have just ordered a room service dinner at the hotel accompanied by mint tea – just for change. It was not because of that plump golden bottle of Tokaji wine on our table, but since I have so much work to finish tonight, I will be sitting with my laptop until very late writing and thinking about wine. Surprisingly though as my head is preoccupied with wine intellectually, I do not have the need to savour it right now. 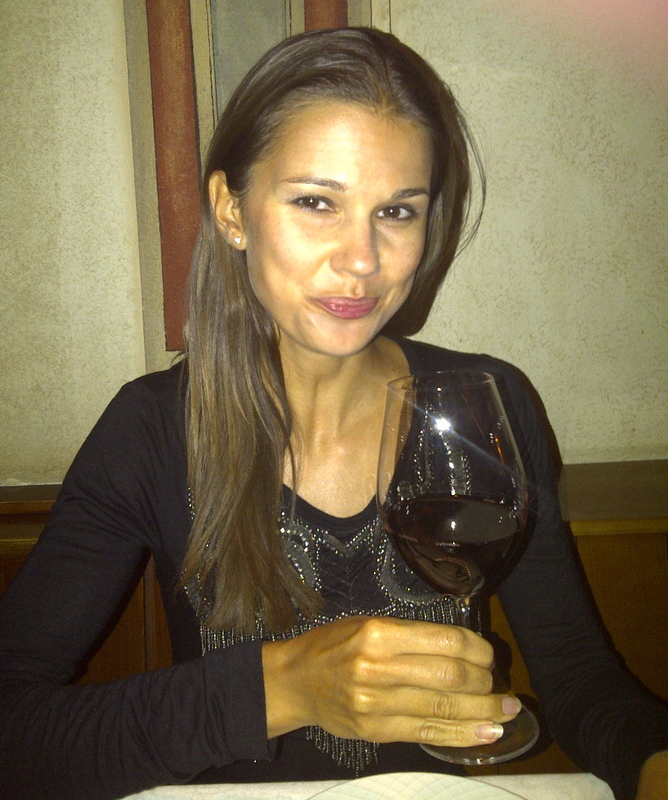 It seems that analytical thinking prevents my thoughts to stray into the seductive wine realm. Strolling all afternoon around Geneva on a hot day makes you think about ice cream and water and not about alcohol. Unless you decide to sit in one of the lake’s restaurants or cafès where almost everyone savours a glass or a bottle of something worth celebrating a sunny day in the city. My lunch was a freshly baked roll from a bakery so I was not exposed to any serious temptation. I love my meaty slices of sashimi with a glass of an Alsatian Gewurtztraminer, Riesling or even an oaky and rich Chardonnay from California. Teppanyaki is a different story though. The dishes are prepared on an iron flat pan (for an illustration look at this funky YouTube video I found) and range from vegetables, eggs to meats like beef or seafood like prawns or squids. Usually, rich savoury sauces used in these dishes make them so intense and flavour-rich that tea rather than wine is a better option in terms of a liquid accompaniment. I had a delicious green brown rice tea called Genmaicha (Wikipedia explains it well), which is sometimes called ‘Popcorn Tea’ (perhaps because it is poping while the rice is roasted). Its smoky, roasted and grassy aroma plays down the intense flavours of the teppanyaki sauces. I am starting to ponder about giving up alcohol for good. I do not want to predict the future, rather ask me once I will have a glass of wine with food again in three days – would I prefer tea to wine then? Judging by their heated discussion and skilful swirling of glasses, the big table in front of my eyes was consisting of wine aficionados. It was like if someone was just having a box of chocolate truffles from Switzerland or macaroons from Pierre Hermè in front of you while you are dieting. My eyes were blinking and my attention was constantly moving in that table’s dirrection. Never mind the group of tanned and toned Portuguese football players in their red shorts striding the garden on the other side. They took my eyes a second to evaluate, but then the shiny white Burgundy in a cool blazed glass… that was another story, the more attractive one. Having French food and especially the gourmet high-end dishes without wine is not only for the French but also for most of other Gallic cuisine lovers like being on the beach on a cloudy day. As the sun enhances the joy of being on the beach, so the wine upgrades the experience tremendously. The pleasure I derived from the dinner was stifled by pairing my artistically exquisite and gustatory narcotic dishes with a verbena tea. I love verveine (as the French call it), but after the dinner, not with it. 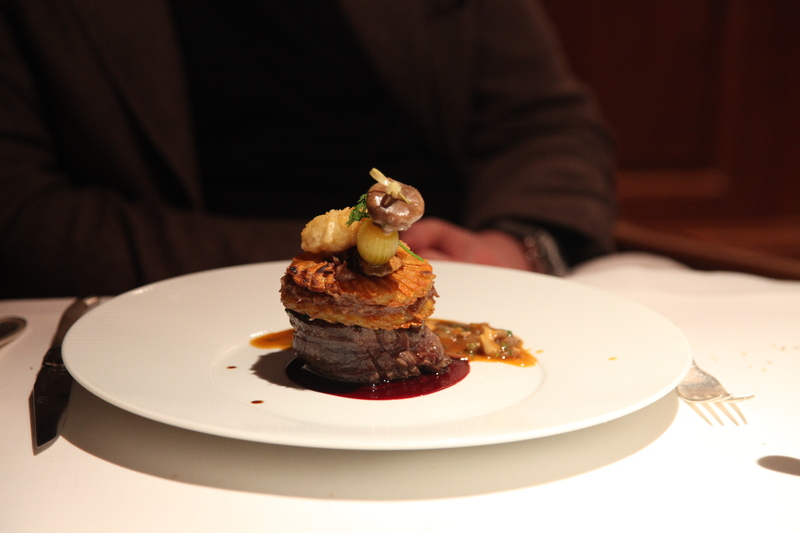 Simply put, the french cuisine is made to be eaten with wine. Therefore, I have decided not to torture myself for the rest of my wine detox and rather avoid French food until it is all over. I am contemplating Japanese for tomorrow. My tea strategy seemed to work so far. On one hand I am substituting wine by tea, but on the other hand I am constantly seeking other pleasures to satisfy my cravings. Ice cream, cookies, chocolate,… they all catch my attention. It is amazing how our bodies are sophisticated – we cannot cheat them. It looks as if we had some system which taps into our head every time we decide voluntarily to give up something. This alarm switches on almost automatically, therefore we need to force it to stop. The force we use is called the will power. Ex-smokers can tell you that they could tweet all day long about their craving being activated by anything not apparently connected to their forfeited habit. Heading to the spa with my laptop and tons of newspapers. Having another adventurous smoothie. This time a hawaii blend. Wow. It starts to look exciting! Perhaps I can learn something about the smoothies’ provenance. After not two seconds of pondering about it, I realise that I just cannot fake it. Anything what is in the hawaii smoothie probably does not come from Hawaii and if it does it is hard for me to distinguish a coconut growing on one palm from the other one, not like wine. Final conclusion – it tastes great so forget about looking for sophistication in anything you drink and just enjoy. The pure feeling you get at most of spas though is the trick though. It really helps to sit in a cosy chair with your robe wrapped around you and a tea kettle a few strides from you so you can refill your cup any time you wish. Thai food for me is the best with jasmine tea. The Thai people often drink it themselves with their lemon grass, chilly and other spices seasoned food. The curries are so powerful and heavy that most of wines would be killed by them. The aroma of almost any wine would get lost in the ocean of coconut or any other spicy sauce in Thai curry. Maybe I was lucky and chose only the dishes which did not tease my palette for wine or there really are not many dishes in the Thai cuisine that are better with wine rather than a glass of water, tea and the local Singha beer. Once in a while almost each of us decides to forfeit one of his/her indulgences. The reasons for that depend on our personal life philosophy. One intends to return the body back to equilibrum, another to prove to oneself that he can live without IT, but most of us sin-inclining human beings simply want to maintain good health. In my case a wine detox equals alcohol detox. Since I rarely drink other ethanol-bolstered drink than wine it is simple – giving up wine for a couple of days. Easy to say, harder to do. As many of you will confirm once you decided on giving up something in life, you want it more. It is psychologically natural to think more about something what we prohibit ourselves to do. That is why many dieters fell. On the other hand, there are some successful ‘givers up’. During my week-long wine detox I have discovered some of the tricks how not to slip and keep up going. I will share these with you now. But first how it all happened or why I have decided to sacrifice my passion for wine? After a month full of wine tastings in various wineries from Loire, through Rhone, Provance up to Spain I felt, conceivably, that it was too much – drinking from lunch (sometimes even before) through the entire afternoon, at dinner and of course some dessert wine before going to bed – my inner supernatural divinity told me that I need to slow down a bit. As the turns, twists and curves of our lives lead us sometimes surprisingly in different directions, the unexpected event sped up the starting point of my wine detox. A night in Monaco. Yes, there we are – an easy place to treat oneself with something special. In my case it ended up with a terrible hangover the following morning – on Friday. One would think that it is the worst day to start an alcohol-free week, but it was an easy decission for me feeling so much under the weather, that the only think I could eat all day was plain cookies. My friends invited me to their summer house near Cannes for a day by the pool. Arriving slightly after lunch with my stomach and head feeling as if I spent a day on a roller coaster and not just a short drive in a car from Monaco it was more than easy to refuse a glass of champagne everyone around me was drinking. Later on seeing my friend’s fathers’ wine cellar would result in normal circumstances in postponing my wine detox at least for a day. What a temptation. God, thank you for the hangover! I thought for myself. On the other hand I was sad that I could not join the mery group in their wine feast. I left them just before the dinner to join my partner for a meal in Cannes. My first normal meal of the day. Lovely fish! I enjoy my wine better with food. Therefore, this would pose the first lure to get a glass of a crisp white Provencial wine. On top of that my partner got a half-bottle! In normal circumstances, the devil in my head would say – come on, leave it for tomorrow, just enjoy today. I guess, that is one of the challenges many of us giving up something have to face. Why to start now? Tomorrow is another day for it. On the other hand one sayng goes – what you can do today, do today and do not leave it for tomorrow. One of my dad’s favourites. So I resisted. Day two follows in the next article as I go through my ordeal.